All for one and one for all! Alexandre Dumas wrote the tales and adventures of the 3 Musketeers. The novels and plays that he wrote are filled with action and clever wording. Although some of his work is not historically accurate Dumas had a knack for bringing his characters to life with the charm and vitality that made his writing so popular. Historically The 3 Musketeers were the French King’s elite guards and were known for their charming courtly behavior in rescuing damsels in distress. Each of these nutcrackers has plumed hats that add an elegant touch to their costumes. They have mighty swords for they all where highly skilled at fencing and other fighting techniques. 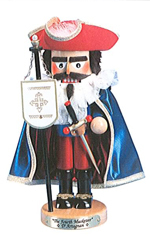 Aramis (ES722), the first nutcracker in Steinbach's Three Musketeer Nutcracker Series, was introduced in 1996. He sold out in 1998. 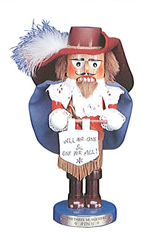 The King’s second royal guard that was introduced into the Steinbach Three Musketeer Nutcracker Series was the Athos (ES1821) Nutcracker in 1998 and was sold out in 1999. The third musketeer that was unveiled into the Steinbach Three Musketeer Nutcracker Series was the Porthos (ES1815) Nutcracker. He is dressed in a velvet cape and lacy collar. Porthos was the rogue of the group who not only guarded the king but tempted the ladies of the court as well. In his hand he holds a sparkling necklace, a stunning bauble of the royal jewels. In 2001 the Three Musketeers welcomed the D’Artagnan (ES1814) Nutcracker into their loyal and powerful circle of defenders of the throne, making him the fourth in Steinbach's Three Musketeer Nutcracker Series. After proving his dedication and bravery, D’Artagnan was initiated into the exclusive group. He has a metallic cloak, lacy collar and a feathered hat. He is a charming figure who woos the ladies but brandishes a sword with ease. D’Artagnan was the final piece in the series.